Once a princely state of India in the state of Madhya Pradesh, Orchha is a famous tourist spot today and hence, it is visited by thousands of history lovers every year. It has always been a major town since its formation during the 16th century by Rudra Pratap Singh, the first king of Orchha State and one of the powerful rulers in Bundelkhand region. For history lovers and certain travellers who are always keen on exploring the glory of the country, Orchha is a perfect weekend destination and is easily accessible from the capital city Bhopal. Dotted with palaces, forts and temples, this ancient town certainly reflects the royalty of the state. 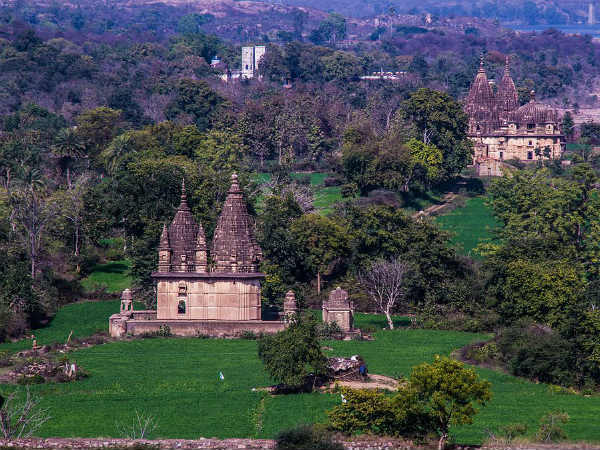 So, if you are looking for a destination where you can learn about the history and at the same time relax amid an uncrowded environment, then a trip from Bhopal to Orchha is your calling. Read on to know in detail about how to reach Orchha and its mesmerising tourist attractions. As the region experiences an extreme type of climate, the summer are hot here and therefore, Orchha remains a least-preferred destination for common tourists during the summer season. However, for every traveller looking forward to scrutinising the ancient beauty of the country, Orchha is a year-round destination and hence, it is visited by them throughout the year. If you desire to avoid the heat of Orchha, then the best time to visit is from October until the end of February. By Air: As there is not airport at Orchha, you need to take a flight from Bhopal to Gwalior and then from there you can hire a cab to Orchha. The distance between Gwalior airport and Orchha is 140 km. By Rail: The nearest major railhead from Orchha is located in Jhansi at a distance of about 18 km. Once you have reached the station, you can either hire a cab or take an auto rickshaw directly to Orchha. By Road: Orchha is well connected to other cities and towns with a good network of roads and hence, it can be easily approached by road. As route 1 will take half an hour lesser in comparison to the other route, thereby, taking you to your destination within 6 h, it is advisable to take route 1. On your way to Orchha, you can also explore the archaeological and historical town of Eran near Bina Etawa. Eran is located at a distance of about 150 km from Bhopal and 200 km from Orchha and hence, is a perfect en route stoppage for a break. The major reason why you should consider Eran as your first stopover is its historical and archaeological significance. Situated in the Sagar district of Madhya Pradesh, Eran is said to have been in existence since the advent of the Common Era and hence, you can find several historical monuments dating back to the 5th century. As per records and inscriptions found, it is believed to be have been a major commercial centre during the Gupta Empire. Today, you can only find several intact and a few ruined monuments. If you love exploring archaeological sites, then Eran is your en route destination. Eventually, you will be within the boundaries of Orchha after traversing the historical lanes of Madhya Pradesh through Bhopal and Eran. Orchha is located in the Tikamgarh district near the historic city of Jhansi on the banks of Betwa river and is a beautiful city to savour and learn about the history of the state. Who wouldn't love to explore this ancient marvel which is filled with the beauty of forts, palaces and historical monuments? Following are the places which you must not miss while visiting Orchha. Dedicated to Lord Vishnu, Chaturbhuj Temple was built during the rule of Mughal Emperor Akbar in the 16th century by the Bundela rulers of Orchha State. As per legends, it was constructed by King Madhukar Shah for his wife, who was an ardent devotee of Lord Rama. So, when the temple was under construction, his wife went to Ayodhya to get an idol of Lord Rama, which was about to be placed in the sanctum of the temple. As the temple was still incomplete, she kept that idol inside her palace and started worshipping worshipping it there itself, which later on, became Ram Raja Temple. Ram Raja Temple was the royal residence of the queen of Orchha state, where she also used to worship the idol of Lord Rama, which was brought from Ayodhya to place inside the sactum of Chaturbhuj Temple. It is also the only temple where Lord Rama is worshipped in the form of a king. Orchha Fort was built by the first King Rudra Pratap Singh in the 16th century to protect his town from invaders. The complex of Orchha Fort houses each and every tourist spot, from Raja Mahal to Ram Raja Temple. It is spread over an area of several acres and was one of the most beautiful forts built at that point in time. Another ancient marvel, Jahangir Mahal was built during the 17th century and is one of the most beautiful Mughal architectures in India. Characterised by hanging balconies, gorgeous designs and commendable patterns, Jahangir Mahal is a must-visit spot for every traveller who loves exploring history and architecture. Raja Mahal is one of the prime attractions in Orchha and is one of the significant parts of the Orchha Fort Complex. It was the official residence of the royal family and was built during the 16th century. It is known for its monumental shape, beautiful architecture and commendable setting. Phool Bagh is a beautiful garden built within the the compound of Orchha Fort and was used as a evening destination for the royal family. It was one of the few places in Orchha State which remained cool even during the summer season on account of its cooling system which was packed with water fountains and ventilation. You must catch a glimpse of this architectural beauty. Apart from all the above-given places, you can also visit Lakshmi Temple, Raj Praveen Mahal, Sawan Bhado Pillars, Paalki Mahal, Khana Hammam, Haurdaul Ki Baithak, Purana Mandir and Royal Chhatris.